Since 2012 an estimated one million people have been displaced in the Democratic Republic of Congo’s (DRC) eastern provinces of South and North Kivu, major ethnic and political flashpoints in the country. However, for many of DRC’s over two million internally displaced persons (IDPs), it is not the first time they are being uprooted from their homes. Multiple displacements have become a feature of the past two decades in DRC and, as the violence escalates, things do not look like improving any time soon. 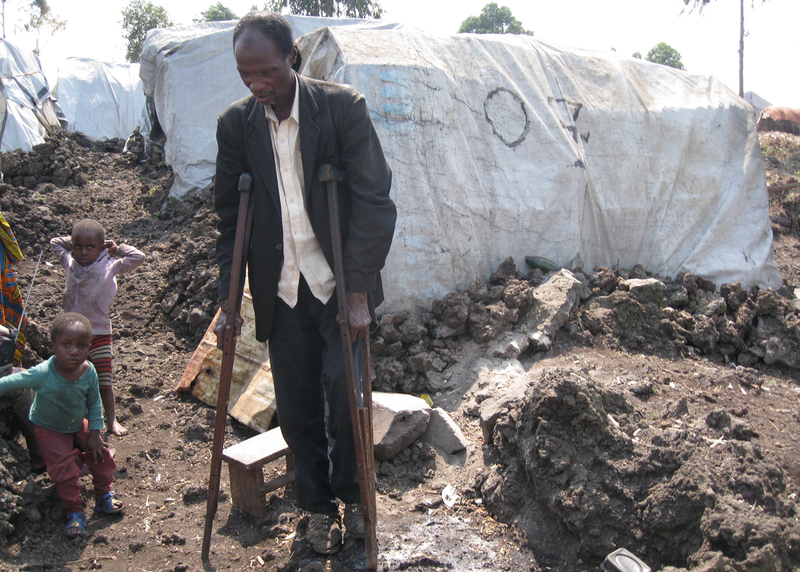 “Multiple displacements are a significant problem in the DRC. Most of the IDPs we spoke to in North Kivu had been forced to flee their homes at least twice, and many others told us of having to flee from one camp to another with each new wave of violence. In many ways, the longer a person is displaced and the more times they have to flee, the more vulnerable they become,” Caelin Briggs, Great Lakes advocate at international NGO Refugees International, told IRIN. A 2013 report by the Norwegian Refugee Council (NRC) found that in some places, 65 percent of those interviewed had been displaced at least twice, while a further 37 percent had been uprooted more than three times as a result of violence. According to official UN figures, there are more than 900,000 IDPs in North Kivu; just 148,772 of them live in the 31 official camps run by the UN Refugee Agency (UNHCR). Those who spoke with IRIN said they preferred staying in sites nearer to their homes from where they can monitor the situation and more easily assess the possibility of returning home. “You just hope the war will end and [that you can] go back to farm and feed your family. When you are far from home, you don’t know what the situation is,” said Xavier, 31, who lives in Mugunga 1, a spontaneous (makeshift) site run by the International Organization for Migration. “At times when you go back home, you stay three days and they [the rebels] attack again and you have to run,” he said. Analysts say the repeated displacements are exacerbated both by the continuing ethnic and political violence and the inability of the DRC administration to protect citizens. “In the absence of physical security or rule of law provided by the state, further strains on social cohesion stem from the broader instability that has seen communities resort to using local defence militia which are typically established along village - and therefore frequently ethnic - lines,” said the authors of the NRC report. In November 2012, for instance, Kanyaruchinya, a camp hosting an estimated 50,000 people emptied within hours when violence broke out around Goma after people fled fearing for their safety, while in late February and March 2013 UNHCR reported that thousands of IDPs fled their sites to the UN peacekeepers’ base in the town of Kitchanga following clashes between the DRC army and armed groups. Oliver Mutambo, 45, who comes from Mutaho, a farming village some 13km north of Goma told IRIN how he was displaced during the country’s first war in 1996. Since then, he has had to run for his life eight times. On one occasion he had to escape from a camp when violence broke out, fearing those from his ethnic community would be targeted. “I was displaced in 1996 when [Laurent] Kabila was fighting to overthrow Mobutu’s government. I thought there would be peace when he took power, but since then I have fled my home eight times to live here [in a camp],” he said. Today Mutambo lives in Mugunga III, a UNHCR managed site on the outskirts of Goma. He has lived there for a year. “Running away from your home only gives you safety at that time. But also in places where you seek refuge, violence can break out between different ethnic communities and you have to escape again. In Congo, you are always on the run,” Mutambo said. Experts like Briggs of Refuges International say those living in spontaneous sites face greater risks. "Running away from your home only gives you safety at that time. But also in places where you seek refuge, violence can break out between different ethnic communities and you have to escape again. In Congo, you are always on the run"
Aid agencies told IRIN repeated displacements had created a challenge in terms of keeping track of the number of IDPs and providing them with humanitarian assistance. “People have been displaced many times and it is making it very difficult to have a verifiable number of those who have been displaced. At times this creates even a challenge in registration of the IDPs, and aid agencies find it hard to offer assistance because of the constant movements,” said Mikala Gloria Ramazani, an external relations associate with UNHCR. Ramazani said that even in UNHCR-run camps such as Mugunga III, people are still vulnerable to attack. The agency no longer pays Congolese police to guard the camps as a result of resource constraints, and the government does not provide any protection. “While official camps managed by UNHCR are relatively safer and their services better, people can still face insecurity because the police are not there. MONUSCO [UN Stabilization Mission in DRC] does patrol the camps but only intermittently,” she said. According to one aid worker, repeated displacement in North and South Kivu will continue unless the government can take charge of the region. “People keep on moving because the violence is spreading even to areas where people had sought refuge. The government is lacking and the government security forces are too lethargic to act. They are busy looking for ways they can survive. The government doesn’t take care of them,” he said. Many people are unable to access their farms as a result of the conflict. Aid agencies like the World Food Programme provide food to the displaced and host communities but pipeline limitations have meant they are unable to cope with demand. “Those in need of assistance as a result of the recurrent displacement are many. We are offering food in seven spontaneous sites but we are only giving half rations because we have little resources,” Djaounsede Pardon, a WFP public information officer in Goma, told IRIN. The DRC army has since pushed back the M23 rebels - one of the many militia operating in the region - and the 3,000-strong UN Intervention Brigade is expected to swing into action soon, but the security situation in Congo’s vast eastern region remains precarious.